Owner Camille Pilar goes from fighting for a clean beach online to running Clean Beach offline. Anyone can share a damning viral photo or send out a few angry tweets to call out a social wrong, but not everyone has the guts to bring the cause they fight for online to the IRL sphere. 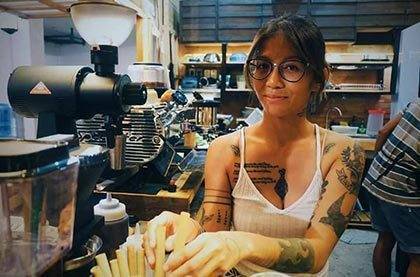 Enter Camille Pilar, a writer and surfer based in San Juan, La Union who made the news back in April when she created Banned from the Beach, an Instagram account that gathers photos of trash spotted on Philippine beaches as a way to condemn beachgoers’ nasty behavior of leaving their garbage behind on the shores they claim to adore. Here, Camille tells us how she came up with Banned from the Beach, how that social media campaign gave way to a social enterprise, and what she recommends you do if you ever set foot in LU—besides visit Clean Beach, of course! You were part of our story last year on girls who left the city to live in a beach town. Even back then, you were already passionate about keeping the beach clean. What prompted you to start the Banned from the Beach Instagram and Facebook accounts? I started Banned from the Beach after seeing how much trash got left behind on the beach following the Holy Week vacation this year. I knew that I wasn’t the only one saddened by this, so I used social media to get the message across. The account was meant to transcend locations because protecting the beach is a concern everywhere in the world. Within hours, the account received submissions from individuals from different regions of our country. Since almost everyone has an Instagram account these days, it was the ideal platform to disseminate a message about manners and mindfulness. Have you always been concerned about the environment even back when you were living in Manila? I became more conscious of my consumption of single-use plastics when I moved out of Manila. I guess it’s easier to give in to “convenience” when almost all of the establishments in the city hand out straws, plastic bags, and to-go cups like it’s nobody’s business. However, living by the ocean changed all of that, and now, there is absolutely no way to go back to the old ways. I see the effects of mindless plastic consumption first-hand because I’m at the beach every day. Using social media to reach out to those who live in the city is one way to make more people aware that the trash doesn’t go away on its own. It’s tiring and daunting, but once you see the effects, there just is no other way but to keep urging people to practice better habits. Have you noticed any changes since you brought this issue to light on social media? I am happy to say yes! There have been many positive effects, simple and small they may be. First, I got to know many like-minded people who have extended their support in sharing the same message. Through this network of individuals, I got introduced to organizations like La Union Soul, S.E.A. (Siargao Environmental Awareness) Movement , and Plastic Battle, a group that encourages businesses to put up water refilling stations instead of selling bottled water. In San Juan, other establishments have since ditched plastic straws. Seawadeeka, a resto that serves good nasi goreng and satay meals, sourced bamboo straws from our shop and they are now also plastic straw-free. The next goal is to get rid of takeout cups altogether. On a personal level, I strive to lessen my plastic consumption even more. Slowly, my friends are also starting to do the same. Also, it makes me endlessly happy to see more people picking up trash from the beach. There is still so much work to be done, but it’s rewarding to see your efforts bear fruit little by little. What made you decide to open Clean Beach? As a new wave of development washes over our surf town, we wanted to act on the need for balance between progress and preservation. We can’t just keep building new shops and selling more products without giving back to the environment. All these natural resources are limited. If we don’t do anything to protect the beach, who knows how long the beach will stay safe and friendly? To keep a good thing going, you have to give back. Tell us about your business partners at Clean Beach. How did you guys get together? My boyfriend Harold and I were just thinking of setting up a small business in our garage. Homecooked meals the way we would serve our surfer friends. 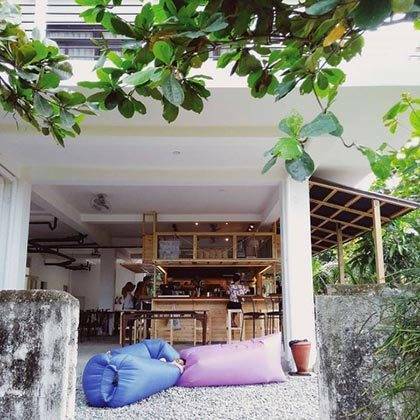 When Tina Antonio, owner of Urbiz Garden Bed & Breakfast and founder of La Union Soul, found out about our plans, she offered us a spot in 134 Beachfront Collective. Then that’s when we learned that guys from EDSA Beverage Design Group were planning on putting up a specialty coffee shop in the area. So we all talked and learned that we had similar goals so we decided to work together. Our partners from EDSA take care of the coffee and beverage side of the business while Harold and I manage the daily operations. We are quite fortunate to be working with some of the best coffee professionals in the industry. Miko Simangan is the head roaster at EDSA and Kevin Israel Fortu won the Philippine National Barista Championship in 2013. How do you integrate your advocacy of keeping the beach clean in Clean Beach’s operations? We hope to inspire even more people and establishments to reconsider their consumption of single-use plastics. We don’t have takeout cups in our shop; instead we encourage people to bring their own tumblers and we reward them with a P10 discount for their effort. We also have reusable bamboo cups that people can buy or borrow in case they want to take their drinks out as they walk on the beach. Whatever we do, we want to make it easier for people to care more for the beach and for the environment. We don’t want to add to the problem so we’re focused on looking for simple but effective solutions. We all know that plastic consumption is a difficult global issue. But we can start to see change by practicing new habits. Once people see how unnecessary takeout cups and products in plastic bottles are, they will start to consciously choose to reuse and therefore reduce our impact on the environment. And hopefully, when the demand for plastic products lessens, even the big companies could make the call for more sustainable alternatives. At Clean Beach, we reinforce this by making people feel good when they care. After all, everybody wants a clean beach. Besides Clean Beach and Banned from the Beach, in what other ways do you raise awareness about caring for the beach? We have water refilling stations at the shop and we encourage people to refill their tumblers at no cost. Water should be free! We also actively support organizations and events in San Juan that aim to spread the message on ocean health and preservation. We work with local groups like La Union Soul and CURMA, which is a group advocating pawikan conservation. The La Union shoreline is the natural habitat for green sea turtles and Olive Ridley turtles. These turtles lay eggs here, which is why it’s important to always keep the beach clean. What do you recommend visitors do at Clean Beach? 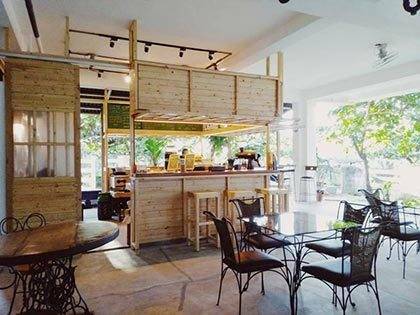 When you order coffee, fresh fruit juice, or draft beer by Engkanto Brewery, you can also borrow our beach chairs and take them to the beach so you have front-row seats to the waves. Come back at sunset because La Union always puts on a good sky show. We have simple comfort food made with love! 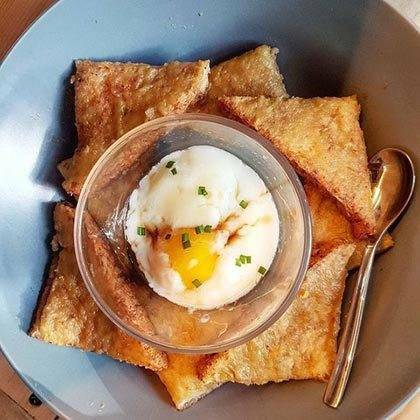 Try the Kaya Toast, the Ohana Burger, or the Buffalo Chops. Do you have unused tumblers at home or at work? We also accept tumbler donations. We clean and store the tumblers so other people can use them when they need to. By doing this, we help people get comfortable with using tumblers or reusable cups. What other places and activities would you recommend to someone visiting San Juan? If you are looking for a more relaxing kind of LU trip, you can book a room or a cabana at Urbiz Garden. 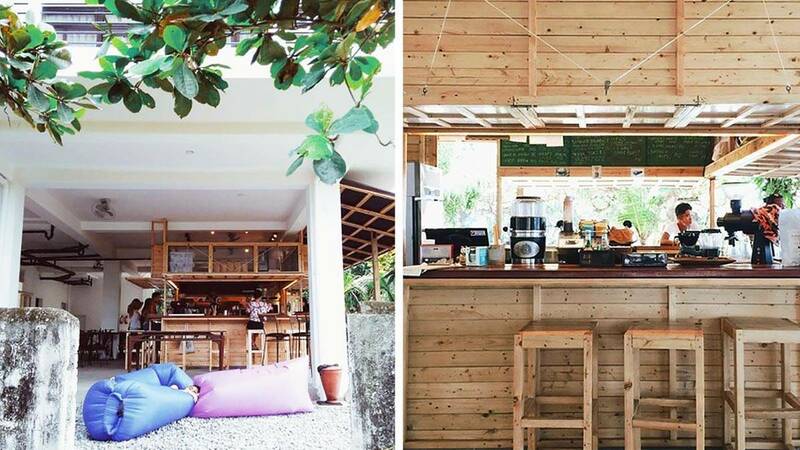 Clean Beach is located in the new building called 134 Beachfront Collective; beside us is Choka Restaurant and they serve Pinoy rice meals and build-your-own breakfasts at affordable prices. They also have a small gift shop selling local goods from Wave Nomad and other local LU artists. If you are into yoga or if you want to learn how to practice on the mat, you can book a class with Aquanimous Yoga, which is also located inside the premises. Up for a challenge? You can try the Aqua Firma class, which is yoga on balance boards, or the SUP yoga class, which is yoga on stand-up paddleboards. If you need to get some work done, you can connect to the free Wi-Fi and get productive right by the beach! What do you want to tell tourists visiting Philippine beaches? Take care of what you love. If you love going to the beach, if you love surfing and being in the ocean, it’s time to think about what’s best for our playground. If we don’t do anything, we might lose our favorite beaches and surf spots in the future. It has already happened to other spots due to greed and neglect. We can’t let it happen here. Clean Beach is located at 134 Beachfront Collective, MacArthur Highway, Brgy. Urbiztondo, San Juan, La Union. Follow them on Facebook and Instagram, or contact them via cleanbeachco@gmail.com.